Wedding in Las Vegas - the city with many different Wedding Chapels. There is probably no other city that can offer you exactly what you want in the case of a wedding. Should Elvis Presley be a witness? Should it go on a second or perhaps an entire day. It is entirely up to you! To get married in Las Vegas, you need to show your identity with a driver's license, passport or birth certificate. If the document isn´t in English, you should translate it. You must be over 18 years. You also need to apply for a wedding licens which cost about $ 55. You apply here Marriage Bureau, 201 Clark Avenue. There are several wedding chapels in Las Vegas and many of the major hotels have their own chapel such as Bellagio, Caesars Palace, The Venetian and others. Egentligen behöver du inget hindersprövningsbevis men varför inte ta med det "ut ifall att". 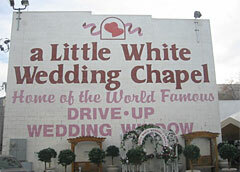 The white chapel has existed for over 50 years and is a known place in Las Vegas to get married at. There are 5 different chapel on the spot, such as a Drive-through and an Elvis chapel. Friends, Good Morning America and Geraldo etc. Some wedding chapels in Las Vegas! In this chapel you can marry traditionally or why not choose an Elvis wedding where an Elvis Presley copy carries out the ceremony. You can also go here to renew your vows or just make a pretend wedding. This chapel also provides Gay Marriage Ceremonies. And ... do you want to get married in front of Las Vegas's most famous sign - Welcome to fabulous Las Vegas Nevada - they make it happen.. Here you have the chapel where many celebrities have been married. Jon Bon Jovi and his wife Dorothea, Jay Leno, Billy Ray and Tish Cyrus. This chapel can be found on "the Strip" and has been in existence for over 50 years. Considered as one of Las Vegas's most beautiful and most elegant chapel to get married in. Here you can choose from a couple of different chapels. For those of you who are Startrek fans why not get married on the bridge on the USS Enterprise and have Klingon as a witness. 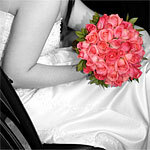 Choose from weddings like: Captens wedding and admiral wedding and more. This chapel is in the middle of everything. They have both traditional weddings but can also offer Elvis packages and wedding in Red Rock Canyon. For those of you who like golf and might want to perpetuate your wedding at a golf course... The track is located 20 minutes from the Strip. Address: 11111 W. Flamingo Rd. Many specialize in outdoor weddings, may be next to a waterfall, mountains, meadows, yes... almost anywhere outdoors. The Terrace offers, palms, torches and waterfalls. Other chapels you will also find in the list "Outdoor weddings" to the right. The Terrace is located 15 minutes from the Strip. If you want to read about wedding in Las Vegas. 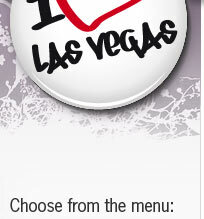 Buy the book: "Las Vegas Weddings" by Marg, Susan. How long or short time have sertain couple been married before divorsing? Britney Spears married in "The Little White Wedding Chapel" on 3 January 2004 with her old child friend Jason Allen Alexander. Britney Spears gifte sig i "The Little White Wedding Chapel" den 3 januari 2004 med sin gamla barndomskamrat Jason Allen Alexander. They were married in a total of 55 hours. A marriage that lasted a little longer, was between Angelina Jolie and Billy Bob Thornton who married in the "Little Church of the West" in May 2000 and separated in May 2003. Another well-known couple, also married in the "Little Church of the West", was Richard Gere and Cindy Crawford. They were married between 1991 - 1995. Pictures: Top picture Las Vegas - en.wikipedia.org / others - resp. chapels website.